I may have mentioned before, but it is Autumn in Asturias. The leaves have turned. The cider lorries collect the roadside sacks of apples daily. And round every bend on every winding back road huddles of people clutching baskets, carrier bags and, of course, sticks hunch to their task of collecting chestnuts. As do we. It’s quite impossible to resist. 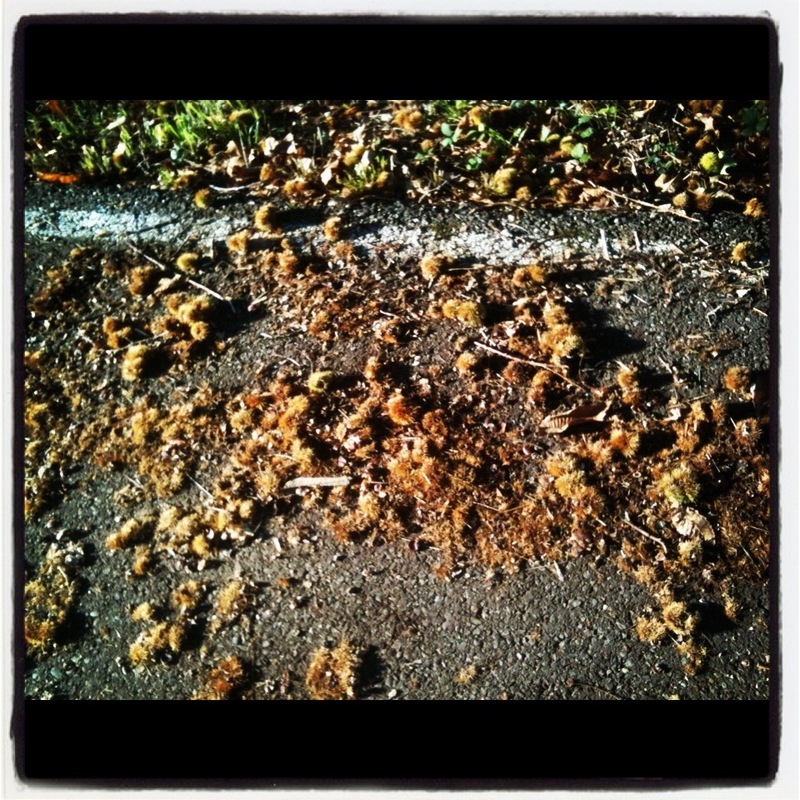 The proliferation of the sweet chestnut tree is such that the roads are carpeted in their fruit at this time of year. In fact, I regularly suffer pangs of conscience as the car bumps over yet another prodigious patch of them, plastering them pointlessly to the tarmac. Such waste. So, quite apart from dedicated foraging trips to the woods or chestnut groves, and much to the annoyance of our energetic greyhound, our daily roadside walks have become grossly extended in time but not distance, as I cannot resist stopping to stuff my pockets to bursting every few paces. As I roll yet another spiky chestnut casing underfoot to reveal its shiny bounty within, the hound prances about impatiently, occasionally resorting to a gentle nip on my sleeve to remind me where my focus ought to be. Luckily, in addition to bones, meat and all things stolen, our greyhound is also partial to a roasted nut or two, so his payoff comes in the evenings, as he lolls in front of the woodburner which currently doubles up as a perpetual chestnut roaster. 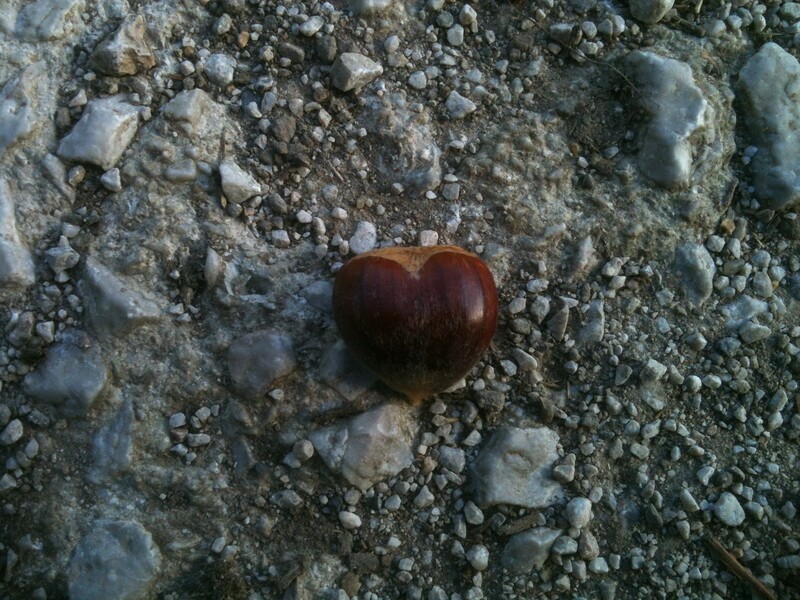 The history of the chestnut in the culture of Asturias is as rich as the velvety flesh of the nut itself. Introduced by the Romans, the chestnut was the staple food of northern Spain for many centuries, providing the main source of nutrition and being consumed in many forms, including flour. Knowing this, the nutty autumnal abundance falls neatly into place. 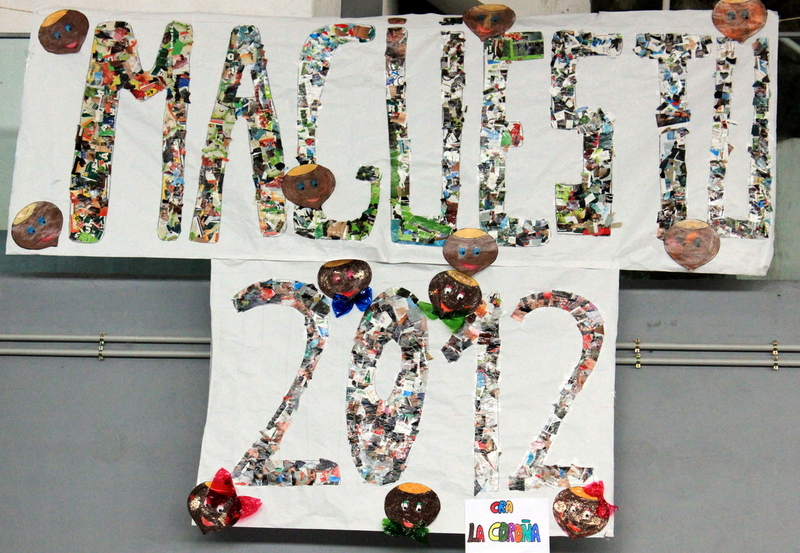 And so it is that the Asturian version of harvest festival, ‘amagüestu’, is a celebration of both the apple and, primarily, the chestnut. 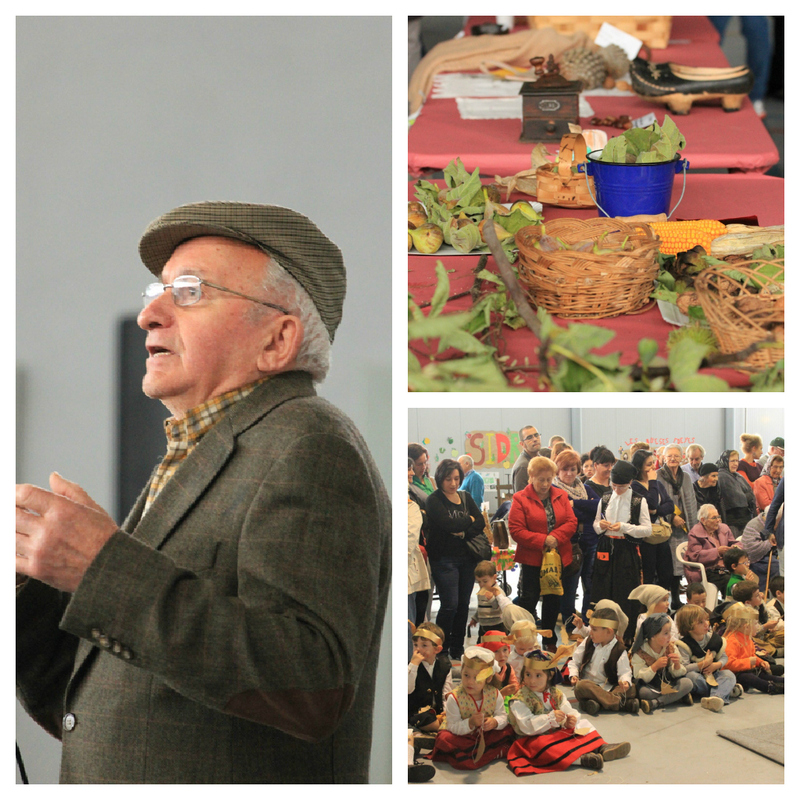 And where better to learn about the traditions of a harvest festival than in a school? All in all it’s a wonderful event and we feel privileged to be part of such a strong community that is still so clearly attached to nature and the traditions that spring forth from that. 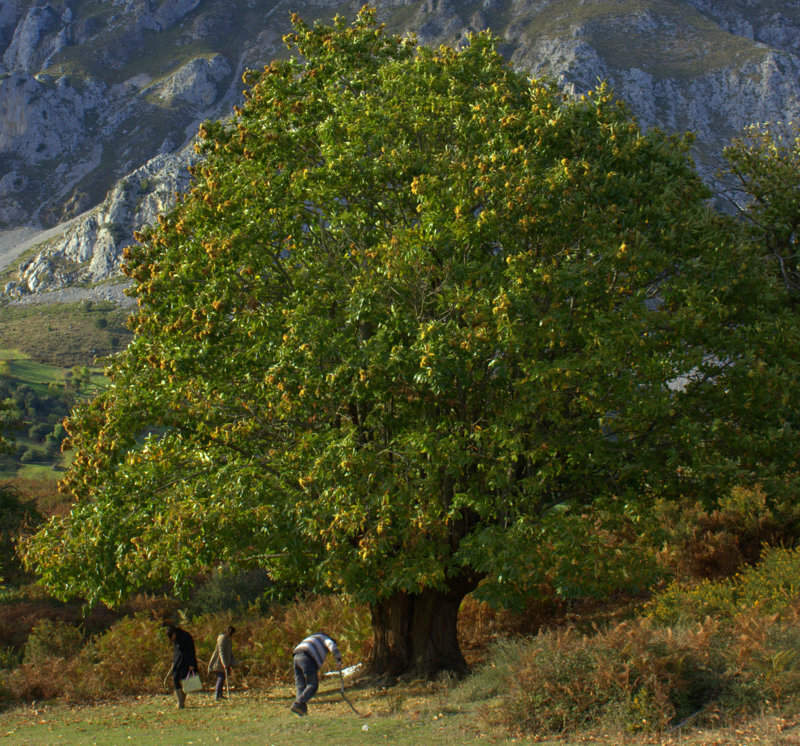 Mind you, you don’t actually need to go to any school to realise that – you just need to drive down an Asturian country road in Autumn and see all the chestnut collectors in action. The application period for admission into state schools is now open here in Asturias. It’s a snappy 10 days, 10th-20th April, so there’s no time to hang about if, like me, you’re planning to pack your little darling off to school here for the first time come September. The Spanish government currently offers each child a place in school in the autumn of the year in which they turn 3. It is not actually compulsory to start in formal education until the age of 6 but most parents do take up the offer at the earliest opportunity. Apart from anything else, on a practical level, for working parents, it’s good, free childcare. It’s a very generous provision, especially when you consider that children from rural areas are also provided with free transport and, in many schools, cooked lunches. Given the current economic situation here and with more cutbacks scheduled to be announced this week, one must wonder how long the Spanish government will continue to foot this particular bill. Already, cuts in nursery places have been announced. But for now anyway, the admissions applications are being accepted and we’ve already collected our form to fill in and gathered all the requisite accompanying paperwork. All that remains to be done is some photocopying and the purchase of 2 passport sized photos of the would-be pupil. Oh, and some long, drawn-out parental soul-searching. 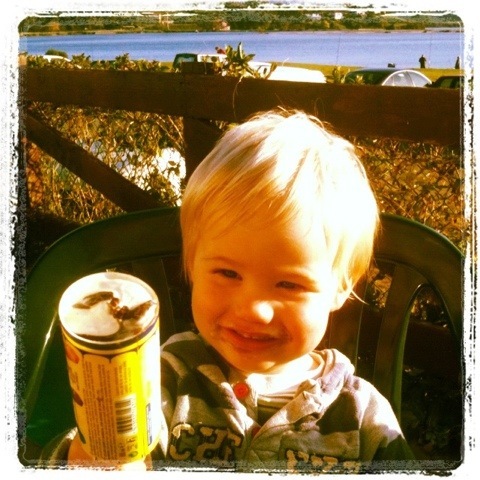 If Jack is to start school this year, he will be doing so two months before his third birthday. I mean, that’s clearly too young to be starting school, right? That’s practically still a baby. And good luck to anyone who thinks they can get him to sit still for hours on end. Or rather, no, bad luck to them. He is a vibrant bundle of energy that I really just don’t want to see tamed (for the sake of taming) too young. Having said all that, while the under sixes may be starting at school they are not starting in ‘primaria’. They have their own ‘infantil’ (kindergarten/nursery) teacher and their days are much more play based and less rigidly structured. There is quite probably less ‘taming’ being practiced than I fear. The school itself is small, with 15 pupils and 2 full time teachers (plus visiting teachers in English, music and P.E. – pretty amazing really!) and Jack already knows a lot of the children. Plus his three best buddies from the village here will all be there – Pelayo will be starting at the same time as him, while Cova and Alberto will be going into their first year of primaria – big kids already. All of this should make the transition easier for him and, crucially, desired on his part. He is a hugely sociable little boy who just adores being with other children and really enjoys his current two days a week at nursery. I guess the bottom line is that I still can’t help feeling a (not so) little pang at the thought of it all. Must remember, I’ve only got to hand the application over by the 20th of this month – not my child.